..... Click the link for more information. believed to have magical powers. The spell can be used for evil or good ends; if evil, it is a technique of sorcery. Many authorities believe that the spell was the precursor of prayer. In Teutonic lore, the spell was a form of exercising occult power and was sometimes used to summon the spirits of departed heroes to give prophetic utterances. Once cast, the spell was supposed to remain in force until broken by a counterspell or exorcism. 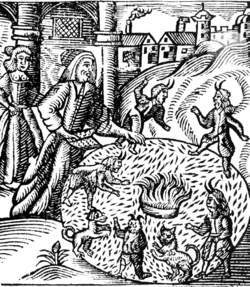 A witch conjuring demons, along with a demonic cat and dog, in order to divine the future, 1688. Courtesy Fortean Picture Library. A spell is part of an act of magic, the essence of the actual working of the magic. While magic itself is causing something to happen that you want to happen, a spell is the ritual act of bringing about the desired result. A ritual is made up of "things said" (legomena) and "things done" (dromena). A spell is usually the legomena of the ritual. Important to a spell are rhythm and rhyme. Many spells are chanted, or even sung, and they have a regular beat to them, usually with the words rhyming. This is to bring about a trance-like state in the practitioner, aiding in the visualization of the goal and helping build the power needed to project to that goal. Not all spells rhyme, however. Prayers are actually spells. They are desires directed to deity, with thoughts aimed toward the accomplishment of the desire. Prayers are usually made up of words coming directly from the heart, with little thought of rhyming what is said. The feeling expressed is powerful and compensates for the lack of rhyme. Prayers are the least dynamic of spells yet can still be surprisingly effective. In Wicca, spells are usually cast from within the ritual Circle. This is to protect the spell caster from any negative feedback. Witches may not perform negative magic, but binding spells are generally viewed as being in a "gray area," where the person at whom the spell is directed is neither helped nor harmed. Binding spells are used when it is deemed necessary to stop someone from talking (especially from giving away Craft or magical secrets). Most such binding spells involve the use of a poppet to represent the recipient, although they can be done with no more than a photograph or even a brief example of the person's handwriting. If a poppet is used, it may be of wax, cloth, clay, or similar material. No physical harm comes to the person, but he or she is restricted in words and/or actions regarding the object of the rite. During the century and a half the Speller was widely used in American schools, international trade expanded significantly; however, with the exception of one sentence (Lesson 84), there is no recognition of it. Another aspect that differentiates Speller Metcalfe is their proven expertise of delivering some of UK's highest rated sustainable developments including Passivhaus, MULTI COMFORT and BREEAM, "where there is an appetite to work with contractors who can deliver both to these standards and on a large scale," says James. As well as site visits, Speller Metcalfe has had five apprentices undertaking placements throughout the refurbishment scheme. Speller said in the statement that Cityscape Egypt will examine the latest trends in real estate market development aiming at bridging the supply demand gap on affordable housing projects. The birds appear to either have either been penned or "allowed to roam around the village," according to Speller. Help the Type II speller listen for sounds in the middle of words. If I'd had another lap or two I think I could have had a go at Speller. Sigel faces attempted murder charges related to the shooting of Terrence Speller outside a bar in Philadelphia last summer. border doesn't open soon to Canadian beef, Canada's Agriculture Minister Bob Speller said last week. Transport minister John Speller has rejected the council's proposals on cost grounds. She was a painter who co-owned the Magic Speller, a women's bookstore in Newport Beach, Calif. The concept stemmed from the simple fact that in the 21st century we are spending more of our time in buildings," says Bill Cave, Small Works Director at Speller Metcalfe.